The shameful anniversary of 1979 Catastrophe in Iran (Ghaadessi-e dovom, faajeh bozorke va nangine 22. Bahman 57) the International Conspiracy Plot in Iran and foreign powers' sponsored COUP D'ETATE of 11 February 1979 in Iran (coup d'etat va Towteah ey 22 Bahman 57) and foreign powers' organized regime-change, has effectively made medieval mullahs' illegitimate regime in Iran today a NEOCOLONIAL PROTECTORATE. (Mos-tamar-eh Navin-eh Tah-tol-Hemaa-yeh-eh ghodrat-hayeh beegaaneh). Despot tyrant traitor and Dictator medieval mullah Ali Khamenei (VATAN FOROOSH) and his mullahs' mafia cliques have been committing HIGH TREASON against the Iranian nation for the past 39-years, by selling the country to their foreign powers' masters and protectors. Traitor mullah Ali Khamenei has been receiving his orders and daily political agenda from foreign powers' secret agents known as handlers in his bunker in Tehran - men and women experts in political propaganda, (one spy's cover in his office was exposed recently; that is, daughter of Larijani who is acting as MI6 agent that brings daily political orders for foreign puppet Mullah Ali Khamenei (dalghakeh ajnabi), through her father who is another British Asset, traitor mullah Saadegh-e Larijani an Iraqi born mullah. Some of these foreign agents are disguised as (and with the cover of) close family members of these traitor mullahs and are in Khamenie's office (for evidence of these facts, see the 60 parts audio recordings of the confessions of Jafar Shafiezadeh, who was the head-bodyguard of traitor half Indian mullah Khomeini- the accursed , (Khomeini ey Maloon vatan foroosh, (mesl Khamenei dalghak va nokar-e ajnabi, yek hendi-zaadeh-e zed-Irani), as other mullahs in the illegitimate regime of medieval mullahs, was a well-known British Asset. Overwhelming majority of Iranians, more than 95 %, have now fully exposed the HIGH TREASONS of these stateless British Asset mullahs, and will very soon overthrow traitor mullahs illegitimate regime occupying Iran. Any foreign entity, private companies or foreign goverments, with any contracts (crude oil and other contracts) signed, or to be signed by this illegitimate regime of medieval mullah traitors occupying Iran today, will be declared by the Iranian peoples' true representatives in the future as NULL-AND-VOID, after liberation of Iran from occupation of neocolonial protectorate regime of traitor mullahs. Last edited by Surenareal on Tue Feb 27, 2018 4:33 pm, edited 25 times in total. Help Us, please stop him repeating himself! 1. 1979 Revolution of Iran made by people of Iran against your despotic Shah who suffocated the Iranians. 2. Foreign powers had a role in it but at the end of the day, people of Iran ended monarchy in Iran. 3. Mullahs and Islamists took advantage of the ignorance of the Iranian people and stole the revolution from the people. They established an Islamic so-called Revolution. 4. Still this action doesn’t justify the ignorance of many Iranian people who voted and aided Islamists to power. Uneducated, politically ignorant and illiterate people have no knowledge to establish democracy but they know Islam very well. 5. Today’s Islamic Republic of Iran with all of its flaws is not a colony of anybody. Today’s Iran is a powerful, militaristically strong, technologically advanced and industrially progressed nation. Iran is a regional super power in Middle East and a continental power in Asia. Iran is a global player. 6. IRI has many issues but independence is not one of them. Iran is most independent than anytime in history and for sure more independent than your Shah’s time when your Shah and Imperial Iran were puppet and neo colony of America and grazing ground and economical open farm for the British. 7. Basic problems with today’s Iran is no secularism, one state religion, lack of democracy, no social justice, no working economical plan or platform, corruption and no existence of political parties except Hezbollah. 8. Khamenei, IRGC, IRI Regime are not servants of UK, US or anyone. They are independent but this independence is not for benefit of Iran. This independence is for benefit of Islam, Shiite Hegemony of Middle East and Personal greed and profit. 9. Today’s Iran is a combination of Theocratic Dictatorship and Military Regime. Today’s IRI is revival and continuation of the Safavid Shiite Persian Empire. You should like IRI because they brought the Safavid monarchy to life! 10. Today’s young educated and intelligent Iranians don’t care about any type of dictatorship of Hezbollah or Shahollah which is your kind. Iran thirsts for democracy. 11. 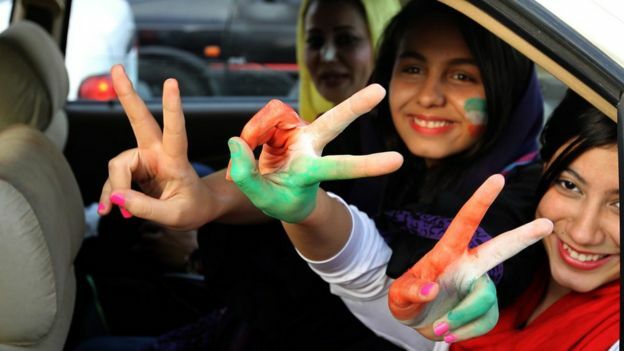 Iranian people in general need to educate and study more so they can practice democracy. The last thing they need is to fall for any type of Dictatorship in the future time frame. Dictatorship will not fly anymore, Hezbollah or Shahollah. 12. Iranian people are not stupid, they overthrew your Shah and they will overthrow Mullahs. One evil does not make the other Evil, good and legitimate. 13. There are two types of Iranians. Those who are revolutionary and those who are reactionary. There is not much difference between you and Hezbollah. Both of you glorify the past dictatorships but Hezbollah glorifies Golden Age of Islam and Safavid Empire but you glorify Shah’s Regime who was the servant of USA and UK. Both of you live in the past but revolutionaries look towards the future, progress and democracy. 14. We have no desire to regress Iran back to the past and in arms of another dictatorship but we want to progress Iran in to the future democracy. You repeat this nonsense 100 times. Look at your posts. Web space is valuable and you are occupying IPC web space with your gibberish and you repeat it 100 times. You have nothing new to write about but you keep on repeating your boring, sad, full of error English, full of error Persian forever. If I was Atusa, I would delete all of your repetitive boring nonsense posts and ban you from IPC. Old monarchists like you are predictable, all the same, repeating the same thing, having nothing new to say and I surely read through them. You are a hollow glass full of air which thinking people can see through you. Repeatedly you yell the same phrase over. You are like an old broken machine stuck on a phrase which is repeatedly spits the same nonsense forever. I really didn’t want to respond to you but couldn’t control myself because you bore me, irritate me and annoy me. Of course, you have this effect on any thinking human being. You said it girl, I’m rolling on the floor choking from laughter! Since I am a prof. let's give you a small lesson designed for the undergraduates in logical fallacies. One of the Logical Fallacies is called in Latin "Ad hominem". In an ad hominem fallacy, you attack the person who is making the argument, instead of the argument itself. As to the repetition of the truth, it must be repeated as many times as possible so that every citizen, out of 80 millions, in Iran will know and hear about it. Only a politically naive, politically challenged, brainwashed, or deceived person (faghat yek saadeh lowh-e siyaasi, fareeb khordeh ya kam-savaad-e siaasee) see the 1979 foreign plot in Iran as a so-called revolution. Saddam and Gaddafi, for example, also called their own coup d"etat a revolution. Last edited by Surenareal on Tue Feb 27, 2018 4:25 pm, edited 1 time in total. ... and he actually can speak something beside his 60 part nonsense! Maybe he is not a robot after all! Your silly post with 60 silly audio bites of another geriatric monarchist is already posted 100 times. I am sure the captive audience can see the delusional conspiracy theory of a handful of geriatric monarchists over and over and over until their death. Only a moron who nobody listens to him repeats himself because he has nothing else to write about and he cannot analyze the history and conclude a logical conclusion from it. Instead he jumps into hypothetic and conspiracies. The new generation knows their parents made the 1979 revolution. Right or wrong they did it. Some agree and some disagree. Mullahs are hated but if you think by twisting the history and pretending that they are UK servants, you can create an uprising, you are wrong because guys like you has been repeating this song and dance for 40 years. Everyone knows many Mullahs historically had the backing of UK but this doesn’t make the Revolution a Coup. The only coup was 28 Mordad which UK and US brought your Shah to power against the will of the people. Your Shah thought they would bring him back to power on 1979 or maybe bring his retarded son back to power but he was wrong. Your Shah wasn’t man of the battle, he was a coward and fled. Your idiotic post has been posted 100 times and if anyone wants they have no choice but to read your nonsense which I am sure they have read and heard about it 100 times before by other conspiracy theorist old bones like you. Repeating it only makes you look like a simpleton who is on weed and alcohol so he repeats himself reminiscing about his good old Shah and good old times in Iran. You and Reza Pahlavi will take the dreams of returning monarchy to Iran into the grave with yourselves. Intelligent people don’t fall for the dictatorship twice. Hezbollah and Shahollah are same in nature. Ps. The reason people attack you is because you leave yourself wide open for attacks. Your posts are same nonsense badly written and posted in your drunken time. Are you sure you are not a robot or a machine hired by Reza Pahlavi to repeat yourself? We also had a Bahai who repeated UHJ nonsense over and over and over like a robot! Brain dead people often do. Hala khar biar o baghali bar kon! You people are so funny. I read IPC for comic relief. I have some wise words for all of you. Accept the revolution. We have established a revolution. We created a republic. Our Islamic Republic of Iran brought to control by people and it will only be removed by the people. Bad luck for you, the people want it. Our republic will never go away so come to terms with it. Try to digest this fact. Jomhuriye Eslami is here to stay. We kicked you out of Iran, we swept all the rubbish out of Iran into ghorbat where you belong. You can scream until the end of the world but Jonhuriye Eslami is here to stay. 2009, 2017 and future yaghi gari or as you call it riots, you can perform but we will sarkoob, eliminate, arrest and punish zede enghelab. You are the terrorists. We deal with terrorists with sarkoob. Ha ha ha ha ha, you little people are so funny. Where is that saliteh Cat? Where is that psycho Ahreeman? So Dokhtar Soosool-e Komonist va Porofosor Ba’d az in va monafegh va baghiye ozgalat can moan and groan until end of days, but Jomhuriye Eslami is here to stay. Hey Professor, are you professor Gharapet? Is it you or is it your shadow? I know you, I used to be your student! Ha ha ha ha ha. Hey professor, are you the professor of Bang or Hashish? Got some good stuff? Isn’t that what you people in ghorbat do? Dokhtareye Ghertiye Komonist, to ham boro kashketo besab. You people are out. We are in and Iran is our country. You have no right to debate what to do about our country. I see you next time I come to states and Europe. Now I have to go eat some top chelo kabob in top Vanak Restaurant. Tell Ahreeman to burn! We are eating good, living good and having lot of fun in our country Iran. Without you, Iran is beautiful. We try to keep it that way. Cockroaches are out the woodwork again, time to exterminate. Overwhelming majority of Iranians today, especially the more than 75 % young Iranians, have discovered and realized that the traitor foreign-puppet Mullahs' regime in Iran today, has been illegitimate from the beginning, as it was an International Conspiracy of Major Powers (UK, US, France, Germany, Italy, and Canada in GUADELOUPE CONFERENCE in 1979) that installed this illegitimate regime of their puppet mullahs in power in Iran in 1979 coup. See also the mission of US General Hyser in Iran, in 1979, to install mullahs' regime, and prevent the Iranian Army of taking power, after these powers' previously well planned the removal of Bakhtiar government, and installation of their puppet mullahs' regime. This is how those powers organized the regime-change and the coup d’état of 11 February 1979 in Iran, and installed their NEOCOLONIAL ROTECTORATATE REGIME OF MEDEIVAL MULLAHS IN IRAN. With their puppet traitor mullah Khomeini, the accursed, a known longtime British Asset, and another foreign puppet traitor mullah Ali Khamenei (dal-ghak-e ajnabi) today, as mullahs are known in Iran to be British Assets. Regime-e ghir-e ghaanooni-e mullahyaan-e Dast-Neshan-deh ajnabi, va Mos-ta-mare- e navin- e Jomhoori Eslaami e TAH-TOL-HEMAAYEH ghodrat-haa-e ajnabi-e 5+1 (Protectorate regime of IRI, emrooz, ghodrat haa yeh 5+1). Ghodrathaayi keh mullah Khomeini maloon, inn vatan-foroosh-e khaa-en-e hendi-zaadeh, va zed-Irani, dalghakeh-ajnabi raa, dar yek tow-teh-a va coup d'etat-e 22 Bahman 57, beh Iran aa-vard-and, va inn regim-e ghyr - ghaanooni mullahyaan-e vatan-forooshan ra beh-mardom -e Iran, taa beh emrooz, tahmill kar-deh-and. For authenticated documentary proofs of the facts mentioned above, listen to the Confessions of Jaffar Shafiezadeh, the chief bodyguard of mullah Khomeini the accursed. These audio files are in 60 parts on You -tube. All patriotic Iranians who want to know the real facts about mullahs’ illegitimate regime, 1979 coup in Iran, must listen to all the 60-parts of these confessions of Jaffar-e Shafiezadeh, on YouTube, they are 100% truths, and pure facts about 1979 foreign sponsored regime- change in Iran. Mullahs' illegitimate regime, with daily political advice of their foreign masters, and their foreign powers advisors in Iran-Rooms of these powers' foreign diplomacies, which is daily and constant, with their undercover agents in the house of traitor mullah Ali Khamenei, these agents are close relatives of mullahs; (such as; foreign agent Vahid-e Haghaanian, the closest to mullah Ali Khamenei and his handler who brings daily orders from his foreign masters, and daughter of mullah Larijaani). For deception to divert the Iranian public opinion from Neocolonial Protectorate Status of IRI, in the past 39 years, the mullahs"' illegitimate regime has used their mercenary non-Iranian arab militias (the mercenaries known as; Hezbollah, Hamas, bassijis, some non-Iranian arab pasdars) to intervene in other weak middle eastern countries, such as; Lebanon, Syria, Yamen, Iraq. The goal of these interventions is for deception, and to recruit thousands of these non-Iranian arabs forces from Hezbollah in Lebanon and Palestinians or Hamas, as; bodyguards, Evin Prison Torturers, and Interrogators, executioners in Iran, or plainclothes mercenary murderers in the streets of Tehran, (the non- Iranian arab mercenary who recently pushed one of the daughters of revolution street), in the other cities of Iran, and in Tehran these foreign arabs act as police in large cities in Iran, and in Tehran. Mullahs' illegitimate regime has taken thousands of these arab mercenaries to Iran, for regime protection, and suppression of the Iranian people's uprisings, and as a non-Iranian arab troops in bassijis. Also serving as thousands of arab guards mercenaries in mullah Ali Khamenei's bunker in Tehran. These non-Iranian arab mercenaries are used as crowds in other regime's events, such as; crowd to listen to the nonsenses (mozakh-rafaat rowzeh khaani) of traitor dictator mullah Khamenei, in his bunker, also these arab mercenaries appear in demonstrations shows organized by the illegitimate regime, and as Friday prayers' crowd. There are so many of these non-Iranian arab militia mercenaries brought to Iran (with often more than $50 k salaries) to protect them from Iranian people. Some of these mercenaries have by now learned to speak some Persian, with accent, and Iranian people can identify these foreign occupiers by their foreign accents. That is the main reason why mullah Ali Khamenei, and his mafia cliques, always wear that black-and-white arab-scarf, called in arabic "keffiyeh" on their shoulders to please his arab guards. The regime has also used these foreign interventions for deception and to pretend that their illegitimate-regime is supposedly independent, not a protectorate which IRI is, and use it to hide their real "neocolonial protectorate and dependent status" for 39 years. The mullahs’ regime tries to hide the regime's total dependence and subservient to these foreign powers, and to the Crude Oil Companies that are their real protectors, masters, and puppeteers. For Iranians inside and outside Iran, one of the most effective ways to liberate Iran from mullahs’ occupation today is to form groups. Become an active member of one of the new political parties in Iran, or outside Iran, for example; Hezbeh Iran-e Farda, Hezbeh Mashro-teh Iran, Hezbeh Social Democrat, Hezbeh Kargar, (Labour) Hezbeh Mohafez-karan (Conservative), Hezbeh Chapihaa (Leftist groups)..etc. Last edited by Surenareal on Mon Mar 12, 2018 11:25 am, edited 21 times in total. You said it not me. A puppet regime which finished by the order of its masters American Generals and UK Officials, best be dead. I see clowns like you every time I visit states or EU. They always stick their foot in their mouth! The tapes fabricated by you Taryaki Monarchist Taghoutiyoun! You don’t make sense. If Iran is puppet of UK and US then how come it is the strongest in history and brought UK and US to their knees? Iran is master of Middle East. Arabs look up to Iran and see it as liberator from West and puppet regimes like Saudi and Arab Shaikhs. Now it’s clear you smoked a bast of Taryak, the good stuff paye manghal and then you wrote this elteghat. Doctors and engineers don’t make $ 50 K in Iran unless they are very special. Baz dooroogh gofti? People in Iran read your lies and laugh at you. How can a pasdars Arab make 50,0000? Very few make a lot of money like I do because we are in business but not everyone. Talk to me about millions not thousands. No fool, they wear it for solidarity with Palestinians and Qods. Did you have a dream again? Then you woke up and the dream was over and our republic is in power? Then you fell back to sleep? Kheyli dooroogh migi va kheyli mozakhrafat mibafi va sheriyat migi. Savad ham nadari, can’t speak English or Farsi for crap. Yes buddy, be khosoos the dead Fascist parties of your Shah time who you forced people to attend the fake parades. Boro kashketo besab baba, smoke more Taryak. Yes we need more Bangi va Taryaki parties for Komoniste gherti and taghoutiye bangi in Iran. Thank you for putting forward a solution. Haji diagnos karedand! Don’t make me laugh. We already have a republic, not perfect but we are building on it. It takes time to make it perfect. The only puppet regime and colony was your Shah regime who took order from London and Washington. Iran is a great Empire and owns Middle East. Soon we own Asia. Are we problem free? No we’re not. We fight corruption, inflation, and few minor issues. There is nothing wrong with Religion mixed politics. Religion is in our blood. Problem is not clerics, problem is corruption and people who aren’t experts in their jobs. We need more technocrats like me who know how to build the country. We need more Kargozaran. Everything in moderation. Hey buddy, Islamic Republic of Iran is here to stay and people like me rule Iran. IRI does not need to end but it needs reforms and minor fixing. People don’t want revolution but they want reforms. Everything will be fixed. Pack up your Dokane Mozakhrafat, go smoke more Taryak and drink more good stuff. Send us some too. Kheyli lata elat migi. You go back to Taryak party and I go back to work building Iran. You are useless and delusional. I am Kargozaran who build Iran. I’m going to Chelo Kaboby to have some Shishlik and wash it down with Doogh. When I do that tomorrow, I will think of you. Hey Professor, who are your students? Bangi va Manghali. You are funny. Haji Joohoodeh, ye aks bezar profilet bebinim che shekliyi. Why don’t you have a picture in your profile. Are you that ugly? You have no face. How does it feel to be an IRI Mozdur? Khambaji shomam nazar dadin? Khambaji, axe khanoom Bozorg ro gozashtin profile! Khanoonm Bozorg hanooz zendas? Esmeshoon chi bood? Shaftaloo? Shakh Banoo? Shaf Banoo? Shoma mesle Shaftaloo har az vaghti yek neghi mizanin! We held you by your rat tails and dumped you in Ghorbat for your life times where you belong. You don’t get to live in Iran because it’s not your country anymore. How does it feel to be a Ghorbati knowing you never go back? Did you enjoy Commie girl? On the second thought, you two can do a Carnival Act Duo, maybe in Circus. You go room to room in IPC, back each other up, bring forward evidence and possibly logic. You can even sing a song and dance. It is amazing what they teach the monkeys these days! What do you say Hussein Hezbo? Don’t worry, if the ward will be uncomfortable for you, I’ll transfer you to Arkham Asylum where you will feel right at home! Strait-Jackets and padded rooms are provided! In continuation of Anti Hejab Protests, the Stadium Protests Starts! 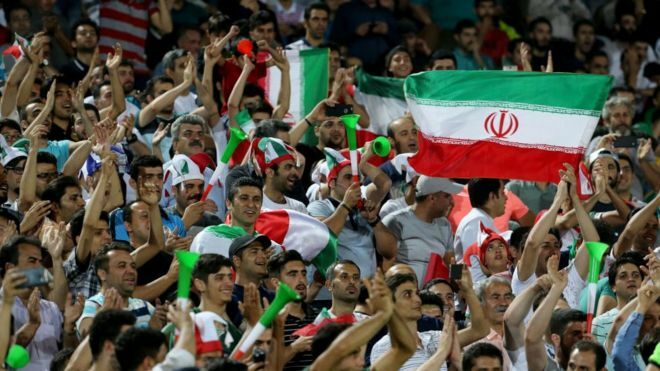 Iran has detained 35 women for trying to attend a football match.